GREEN SHOOTS? IMAGE SOURCE: POTASHCORP INVESTOR PRESENTATION. PotashCorp (NYSE:POT) has had a rough year. In January, for the first time since its 1989 IPO, the company cut its dividend, slashing the payout by roughly 34% to $0.25 a share. Soon after, it issued weak guidance estimates, with volumes looking to fall to a range of 8.3 million to 9.1 million tons this year. Today, potash prices continue to slump, recently hitting eight-year lows. PotashCorp has seen its own sales and profit decline, aided by weakening U.S. and Asia markets, as producers continue to fight for market share rather than earnings. Bulls, meanwhile, believe the slide should end soon, based on factors such as growing demand in India and a rationalized global supply. 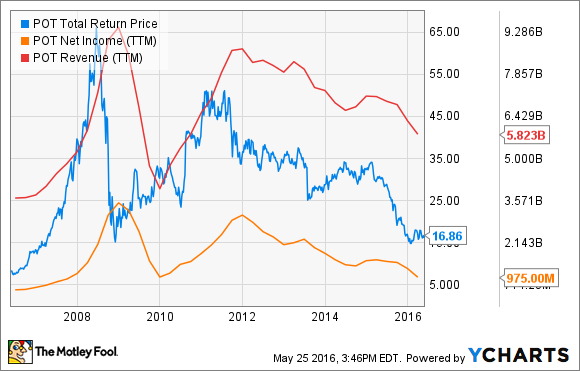 So is PotashCorp primed for a turnaround? One legendary investor, Ray Dalio of Bridgewater Associates, appears to be expecting an eventual rebound in PotashCorp shares. According to his last 13-F filing, his firm bought a fresh position of 721,300 shares worth roughly $12 million. He also initiated a position in competitor Agrium Inc. (NYSE:AGU). Dalio's bet comes during a difficult market for agricultural commodities. Slowing Chinese demand has pushed the Bloomberg Commodities Index down to levels not seen since 1998. Many fear that global commodity demand will be permanently impaired as China focuses on transitioning toward a service-based economy. This climate is having severe effects on PotashCorp's business. This year, China is expected to demand only 14 million tons of potash, down from an already depressed level of 16 million tons last year. The Chinese market for potash is bigger than the entire North American market combined, along with Latin America and India as well. While the latest contraction should prove temporary (given soils need to maintain a certain nutrient balance), demand growth could be set for a paradigm shift. With China being the biggest consumer of potash in the world by far, permanently slower growth could upend the entire market for years to come. 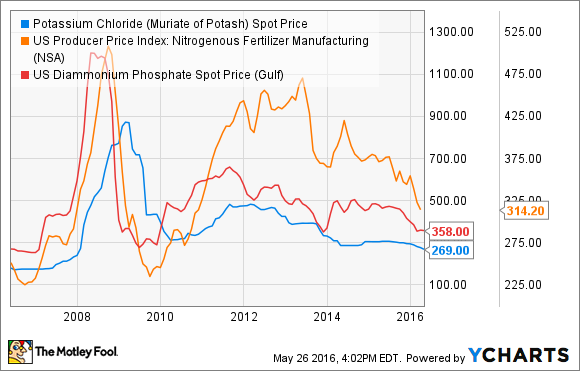 It's no wonder the price of the three major agricultural inputs -- potash, nitrogen, and phosphate -- are under siege. What hope is there for a rebound? Around 60 million tons of potash are mined each year. The top four producers, which account for over half of global output, are PotashCorp, Uralkali, Mosaic, and Belaruskali. Because production is incredibly concentrated among a few key players, industry supply curves are fairly easy to construct. According to Mosaic, roughly 90% of the industry has cash mining costs below $180 per ton. Over half of producers have costs of under $130 a ton. With current prices still above $250 per ton, there's plenty of room left for pricing erosion. That's a big reason Mosaic sees an oversupplied market getting even worse through 2020, with weak capacity utilizations across the board. IMAGE SOURCE: MOSAIC INVESTOR PRESENTATION, http://investors.mosaicco.com/interactive/lookandfeel/4097833/MOSAIC_2015_April_Presentation.pdf page 8. If supply won't be rationalized anytime soon, is there hope for a hidden growth story to pick up China's slack? The United States, Brazil, China, and India comprise nearly 70% of global potash demand. Many of these countries are seeing structural issues that should continue to weigh on demand. China specifically seems to be purposefully gaming the market; it has repeatedly delayed signing potash deals with miners, instead relying on stockpiles to benefit from prices that are slumping to near-decade lows. It will probably wait until prices sink even further to strike new deals. India, another major buyer, has halted its potash imports and delayed negotiations for next year's purchases until at least June, because of severe droughts. Record-low soybean and corn prices, along with the falling purchasing power of the real, is also pushing demand forecasts for Brazil lower. The U.S. is the lone bright spot, where farmers will probably capitalize on the strong dollar and historically low prices. With North America comprising only 16% of global demand, however, don't expect the region to move the needle. In the past, 70% of global production was controlled by two large cartels (and PotashCorp was a member of one), so pricing drops were avoided through coordinated supply responses. Today, after the fallout of Russia's Uralkali breaking away from its consortium partner Belaruskali, markets now set prices. Competition, along with slowing demand and ample cheap supply, should keep a lid on shares until the market adjusts to its new normal. There's no doubt that PotashCorp will become a buy at some point, but the structural issues that the industry currently faces will take years to reconcile.